We enter Holy Week now and always hand in hand with Easter is the Jewish celebration of Passover. This year, Passover, or in Hebrew Pesach, with the setting sun tonight, April 14. The holiday commemorates the freeing of the Israelites from their slavery in Egypt, and is celebrated with a meal, the seder. A friend explains it thusly: “We are traveling through the desert with our ancestors via a table filled with metaphor and symbolism.” Unleavened bread is a central part of the celebration, for the Israelites had to leave Egypt so quickly there was no time to let the bread rise. Instead, it had to be baked immediately. The Italians call Passover Pasqua Ebraica, which you might translate as “Jewish Easter,” but in fact in many languages the names of both Easter and Passover are the same. Pesach informs the name given to Easter in Italian: Pasqua. The English word “Easter” does not share this etymological relation to Pesach. It is related more to the the Old English “Eostre,” which is the name of an Anglo-Saxon goddess whose feast day was celebrated around the Spring Equinox. Among the questions asked at the seder table is this one: Why is this night different from all other nights? And I actually cannot tell you. I’ve never attended a seder. But I will join all who are in spirit tonight and wish you abundant blessings. 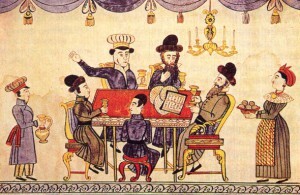 The image above is taken from a 19th century Haggadah by an anonymous Russian folk artist [Public domain], via Wikimedia Commons. Thank you John – your description of the reason for the rich Passover celebration is so clear. It’s your talent for bringing us into the heart of the story that I love.